= Cristaria plicata (Leach, 1814). — Zieritz et al. (2018). = Cristaria plicata (Leach, 1814). — Bolotov et al. (2018). = Cristaria plicata. — Smith et al. (2018). = Cristaria plicata (Leach, 1815). — Do et al. (2018). = Cristaria plicata. — Huang et al. (2018). = Cristaria plicata (Leach, 1814). — Bolotov et al. (2017). = Cristaria plicata. — Lopes-Lima et al. (2017). = Cristaria plicata Leach, 1815. — Sano et al. (2017). = Cristaria plicata. — Guerra et al. (2017). Leach, 1814, Zool. Misc. : 120, pl. 53. Schumacher, 1817, Essai. Nouv. Syst. : 107, pl. 20, fig. 2. Blainville, 1825, Manuel Malacol. et Conch. : 631 [nomen nudum]. Blainville, 1825, Manuel Malacol. et Conch. : 538, pl. 66, fig. 3 . Lea, 1829, Trans. Amer. Phil. Soc. : 445, pl. 14, fig. 24 [as ‘bi-alata’]. 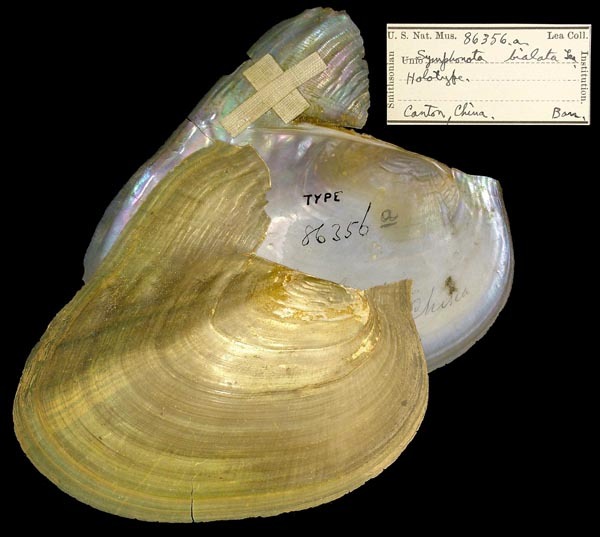 Type(s): HOLOTYPE USNM_86356A, Canton, China. Anton, 1838, Verz. Conchylien: 16, no. 592. Clessin, 1876, Conchyl. Cab. : 93, pl. 27, fig. 2. Middendorff, 1848, Bull. Phys.-Math. Acad. Sci. St. Pétersbourg: 303. Middendorff, 1851, Reise Nord. Ost. Sibiriens: 278, pl. 21, fig. 5; 22, figs. 1-2; pl. 26, figs. 1-2. ‘Middendorff’ Gould, 1849, Proc. Boston Soc. Nat. Hist. : 85. 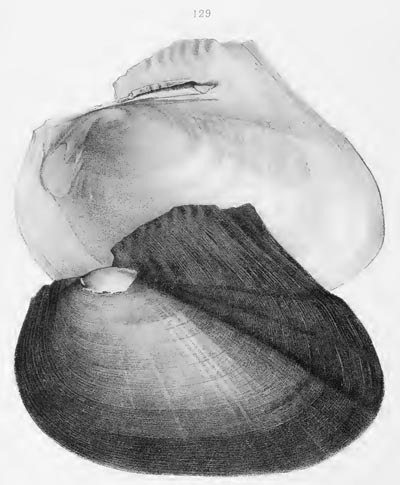 Margaron (Anodonta) onowensis Lea, 1852. Lea, 1852, Synopsis Fam. Naiades: 53. Symphynota magnifica Mabille & le Mesle, 1866. Mabille & le Mesle, 1866, J. de Conch. : 123. “Say” Sowerby, 1866, Conch. Icon. : pl. 54, sp. 280. Morelet, 1875, Séries Conch. : 331 [as ‘Dipsas’]. Type(s): LECTOTYPE MCZ_175610, Lake Touli-Sap, Cambodia, Indo China. 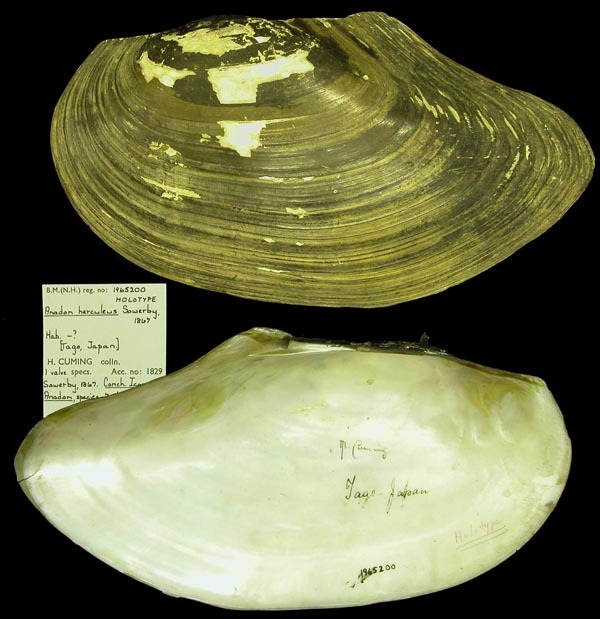 ‘Gertsford?’ Sowerby, 1867, Conch. Icon. : pl. 3, sp. 7. 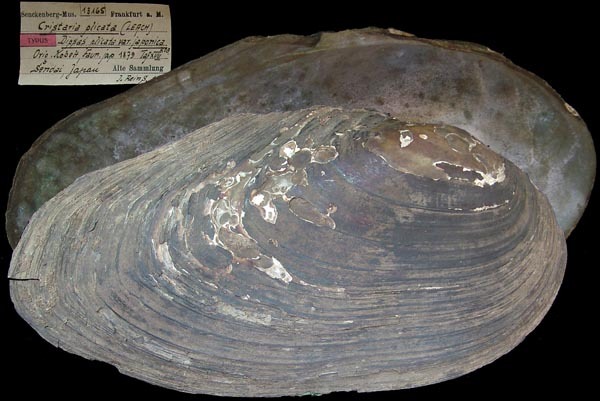 Type(s): HOLOTYPE BMNH_1965200, Hab._? [Tago, Japan]. 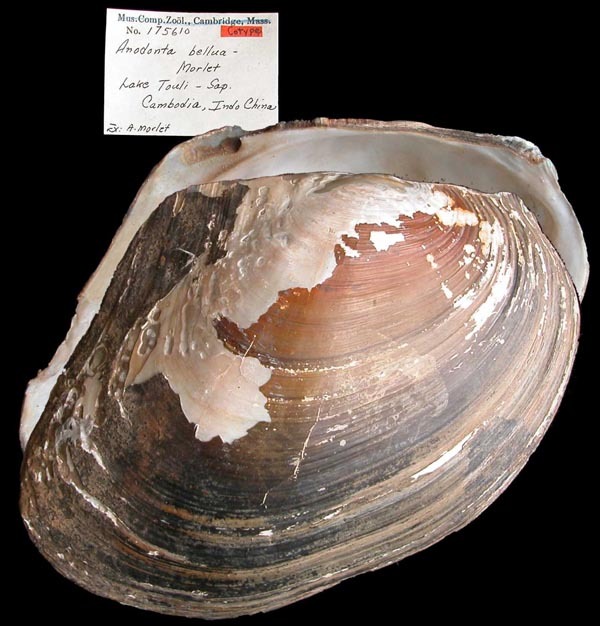 Margaron (Anodonta) ononensis Lea, 1870. Clessin, 1873, Conchyl. Cab. : 123, pl. 35, fig. 1. Anodonta (Dipsas) spatiosa Clessin, 1876. Clessin, 1876, Conchyl. Cab. : 173, pl. 57, fig. 2. 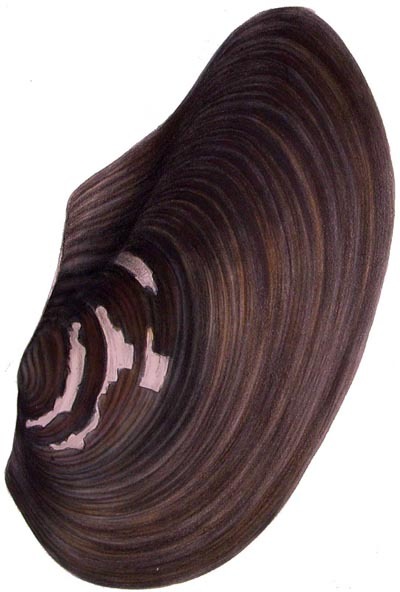 Dipsas plicata var. clessini Kobelt, 1879. Kobelt, 1879, Abh. Senckenb. Naturf. Ges. : 429, pl. 15. Dipsas plicata var. japonica Kobelt, 1879. Kobelt, 1879, Abh. Senckenb. Naturf. Ges. : 429, pl. 17. Type(s): TYPE SMF_13165, Sandai, Japan. Heude, 1885, Conch. Fluv. Nanking: pl. 66, fig. 129. Paetel, 1890, Cat. Conch.-Samml. : 175 [nomen nudum]. Dipsas plicatus Dautzenberg & Fischer, 1905. Dautzenberg & Fischer, 1905, J. de Conch. : 196.